See the top Cultural trips that go through Caesarea National Park, Israel. With 5 tours to choose from, they range in length from 8 days to 11. The most popular month for these tours is May, which has the most departures. 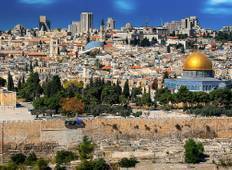 "Our guide was very knowledgeable of the history and background of Israel and shared..."
""The Holy Land Tour". The trip was really interesting, though I would say it had..."